This property was sold in the summer of 2015. These entries remain for historical reference. On these pages, you’ll find photos of the property and surroundings. Some are enlargements from the other sections, but most only appear here. We’ll jump from this and that and back again for a comprehensive overview. 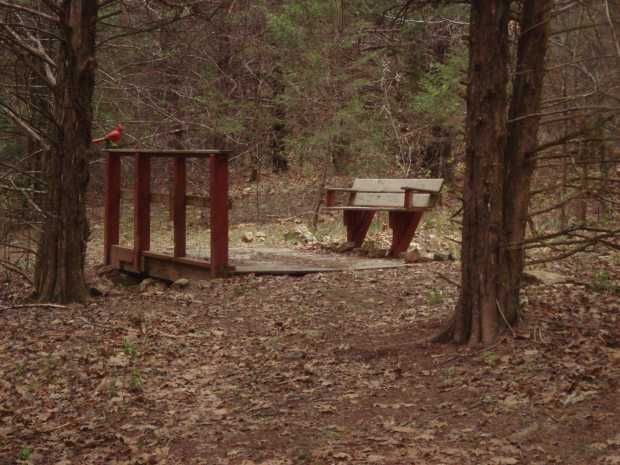 Along the way, you’ll see exteriors and interiors of the main house and cabin, paths, lake, creek, forest, park-like grounds, area attractions, and more. The captions tell the story. Please visit the other links above to learn more, if you haven’t already. After almost a half-mile along the private, on-property driveway through a forest and a park-like approach, you reach your destination. 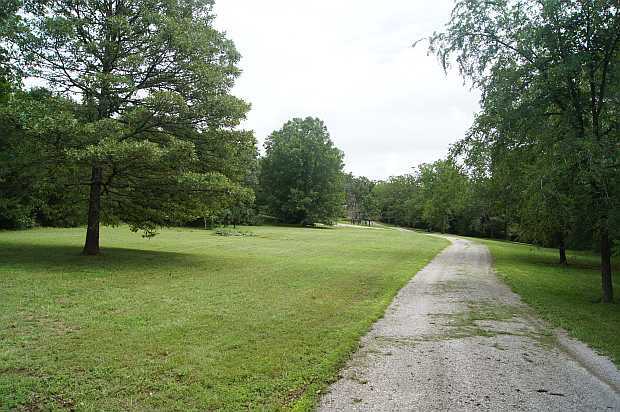 The driveway ends by circling an island of mature trees, surrounded by a complex of buildings — main residence, cabin to its right, detached garage (far left), and even a blended well house/shed (not shown). A few hundred feet beyond the house is Table Rock Lake. 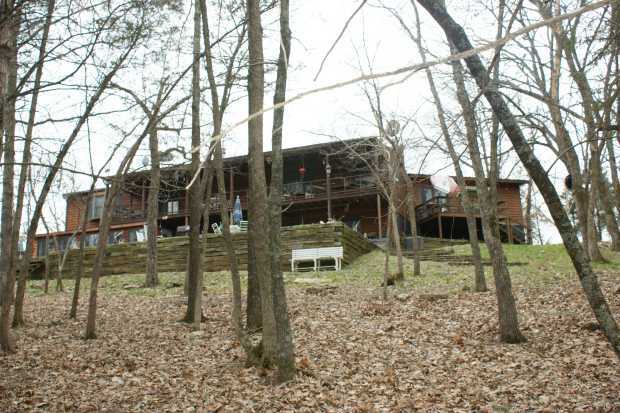 And to the right of the cabin is a small cove completely surrounded by the property. When you first cross the driveway bridge, the forest opens and this is your final approach. The complex of buildings (main house, cabin, garage, and well house) rests straight ahead beneath the farthest trees on the horizon. 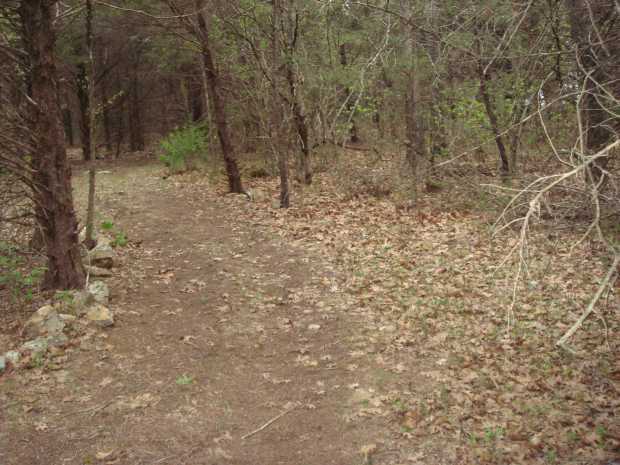 The bare tree rising from the water remains from when the Table Rock Lake dam was completed in 1959. It’s my quick guide to the water level. At the lowest levels I’ve seen, the tree is out of the water; at the highest levels, it has disappeared underwater. Usually, it’s about where you see it here and in other photos — about 10 feet into the lake. 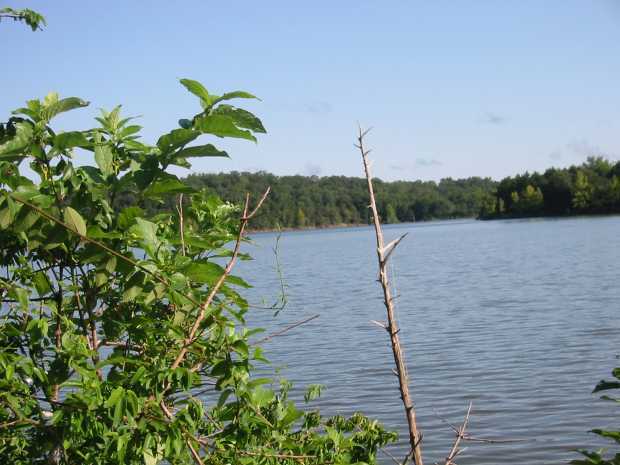 You can quickly check the hourly lake levels online at the Corps of Engineers website. This is about as much as I can show of the main house’s living area in one photo, using a standard lens. Let me take time to explain what you see and don’t see to help you understand it. You’re looking from the left of glass doors (off camera to right) that open to a large balcony that overlooks the lake through tall trees. The fireplace and built-in cabinetry is also not shown to the right, along with a bay window near the also-off-camera dining area. Behind you is a bit more living area and and a wall of built-in shelves next to the door to the master bedroom. Off camera to the left is a second door to the master bathroom, a coat closet, a twin window matching the one on the right side of the main entrance, and an enclave with a door to the carport. Also not shown is the office behind the black accent wall straight ahead. It could easily be converted to a fifth bedroom, but I’ve opened it up with a pass-through to the kitchen area, right behind the wall. In the far distance, is a step-down entrance where the main house previously ended with a workshop door. There you’ll find a sitting area with a separate balcony overlooking the lake and stairs going down to the yard. There are double doors leading to a second bedroom suite I used as my primary office. There’s a half-bath to the left. The suite has its own full bath. Okay, now let’s discuss what you can see. 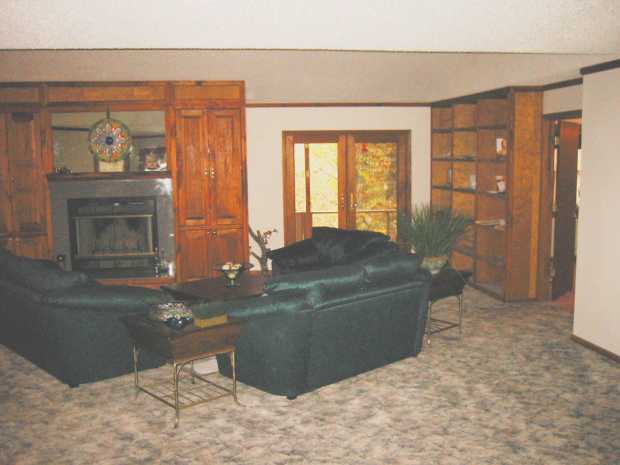 As I’ve said, the layout is hard to explain, as photos don’t show the way areas of the house relate to others. But, anyway, I’ll start on the left. That’s the double-door main entry with large window panels on each side, but only one side shown. There’s a large open area between the entry and the white furniture. You can visualize this by looking at the ceilings. The furniture is under the vaulted ceiling, and all the area in front is open and can be used as you please. Near the right window panel is an area with an antique chandelier that could be used as a second dining area, but I used it as a sitting place with artwork. 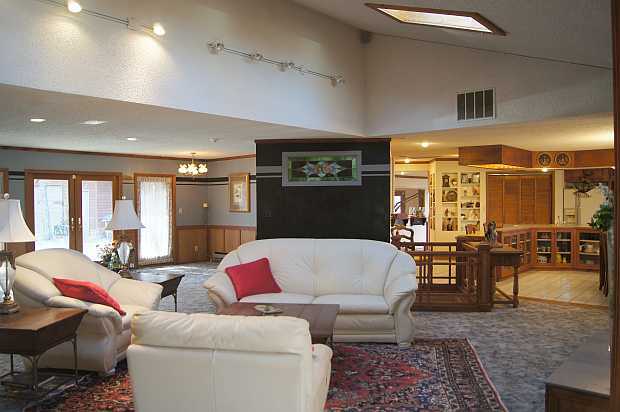 The entrance to the handcrafted four-wood stairway to the lower family area is hidden by the sofa. Behind the sofa is a four-foot walkway, allowing you to move freely and completely circle everything. To the right of the railing that surrounds the staircase is a portion of the kitchen and dining area, shown more clearly in other photos. The lower glass doors open to display or storage shelves under a huge L-shaped island that contains the stove/oven and a bar sink. The refrigerator is in the background and to its left are doors opening to a washer/dryer hookup with shelves that can be easily be converted to a pantry if you choose to do your laundry downstairs. Further left are knick-knack or spice shelves that I had built into two sides of the wall leading to the second suite. 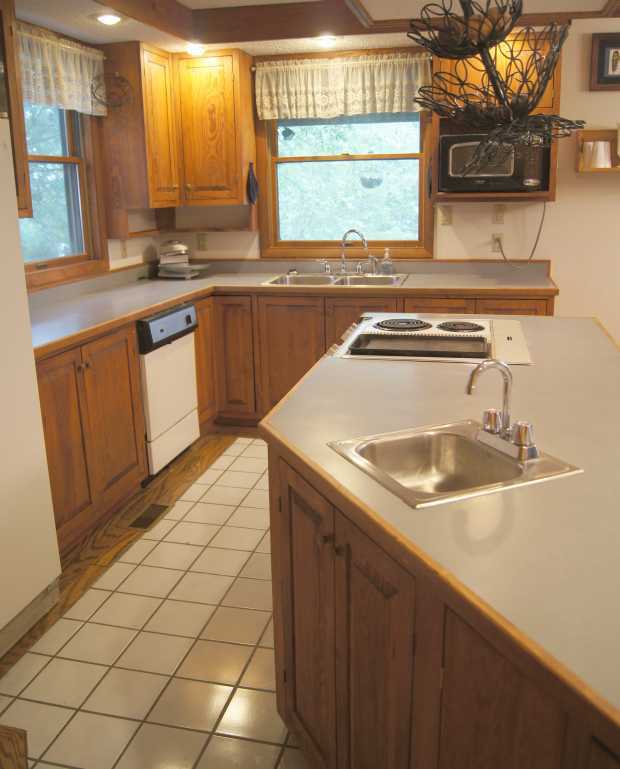 To right of the refrigerator is part of another L-shaped counter with two windows, cabinets, the dishwasher, and the kitchen sink. 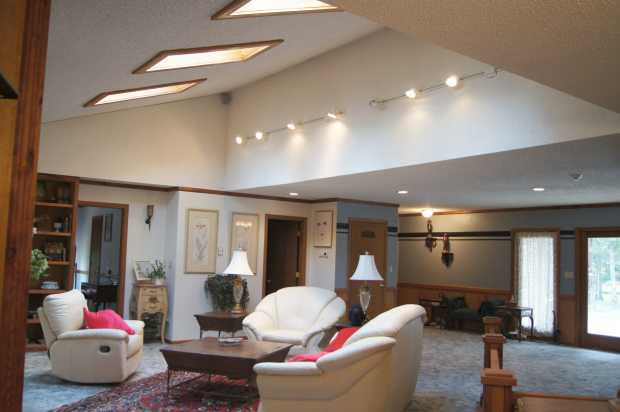 In the upper foreground, you see the last in a row of three matching skylights I had added to brighten the living area. The window behind the sink looks out to the balcony and lake. The second window faces the side yard, and a bay window and dining area are just off-camera to the right. 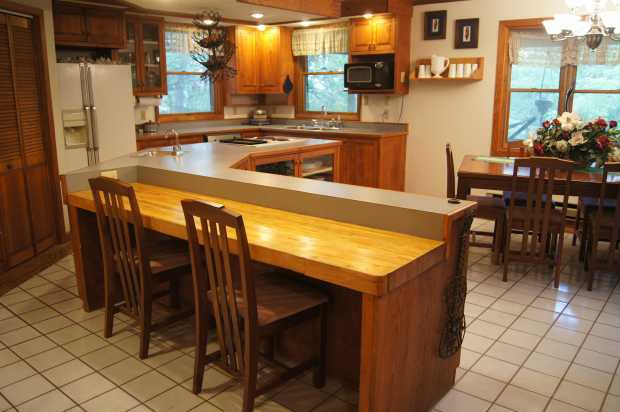 In addition to the upper and lower cabinets you see, there is a row along the bottom of the island, facing the refrigerator. 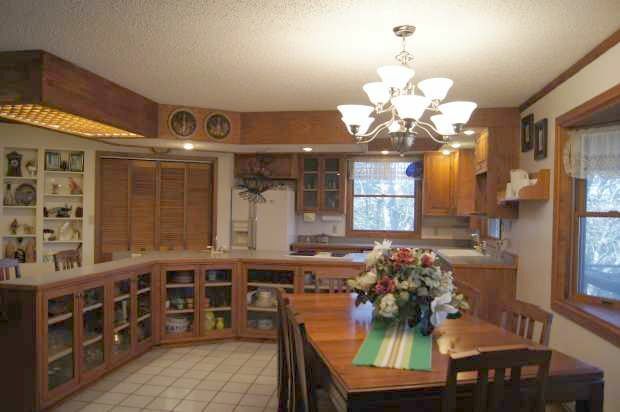 There is also a cabinet above the refrigerator, an L-shaped row of glass cabinets along the foreground side of the island, and a built-in floor-to-ceiling cabinet for dishware in back of the dining table (not shown here). 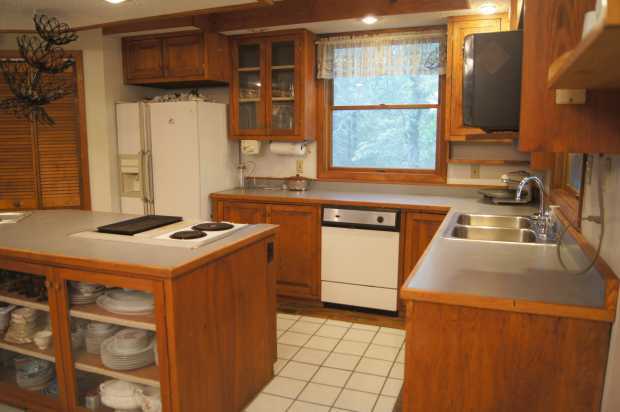 This is a country kitchen that is roomy, open, and easy to maneuver, but definitely not pretentious or showy. You might want to modernize the appliances, although all work well. The stove has four burners (two hidden here) and an oven. It has an unusual feature that allows you to quickly swap two burners for an inlaid grill. It wasn’t until six months ago that I finally got around to replacing the mismatched bar sink and white porcelain kitchen sink with stainless steel ones. If it’s important to you, you could replace the refrigerator, dishwasher, and stove/oven with stainless steel equivalents. If I were still living in California, I would have done that, but in these more relaxed, quiet surroundings, it just didn’t seem necessary to modernize. 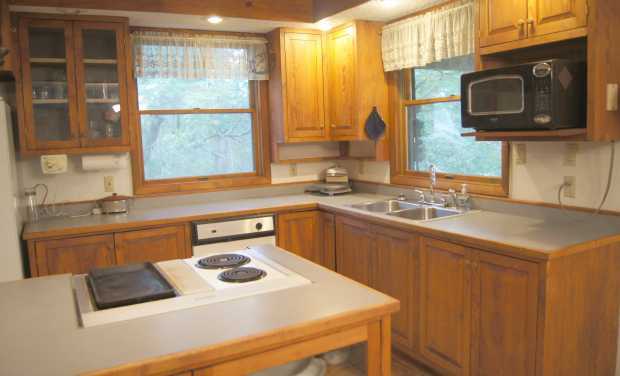 You’ll also notice that the counter tops aren’t granite. I was fine with the color and quality, but you might choose to update them, too. In short, the kitchen area is bright, open, and spacious, but could be improved — if you’re not satisfied with the way it looks. This photo was taken from about 10 feet inside the main entry. Off camera to the left is a seating area, a walk-through office, the kitchen and a dining area. Off camera to the right is a closet, a doorway to the carport, and more area for furniture. The lake is straight ahead, through the glass doors that lead to the balcony. On the same wall as the bookshelf to the right is a doorway to the master bedroom. And another door (not shown) makes the master bath accessible from the living room, too — if you choose to leave it unlocked. What’s the catch? None, really, except what I describe. Prices here are still catching up to the rest of the country. Yes, I agree that it’s a bargain, but only if this is what you’re looking for. 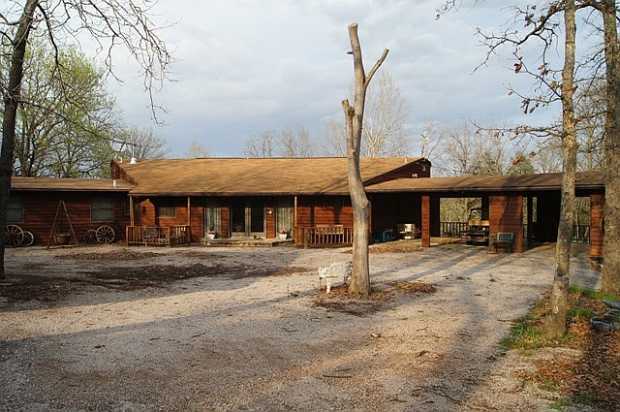 The 41-acre retreat was agent listed for $740,000 in 2012. 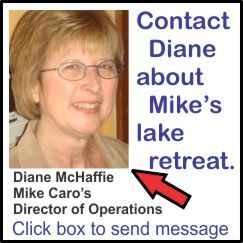 Please read my ramblings about my adventure, the property, the area, and the lake before you decide. I hope to sell to someone who appreciates my retreat and will be happy here. Looks very nice! I’m not planning on moving for 6 more years, but when I do, your place is what I will be looking for. We used to own a cabin on Table rock years ago and I loved it then. We sold it maybe 40 years ago. I would love this place but right now in my life I’m taking care of my 99 year old mother and she won’t move from Kentucky. This is my dream compound. Our place is Just West of Carr Lane on Kings River. Really small old log cabin. Guess I should go buy a lottery ticket. Looks awesome, but will need a job in healthcare. 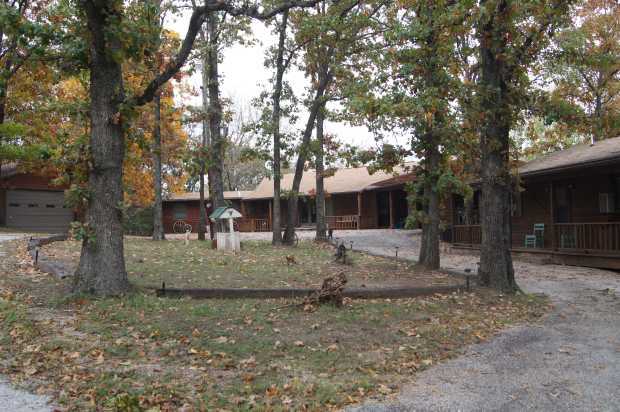 Love the lake views and some quiet, but may need some access to civilization. As a people, we still need eachother, even for a chance to say HI.